Thomas Girtin (18 February 1775 – 9 November 1802), was an English painter and etcher, who played a key role in establishing watercolour as a reputable art form. He was born in Southwark, London, the son of a well-to-do brushmaker of Huguenot descent in. His father died while Thomas was a child, and the widow married a Mr.Vaughan, a pattern-draughtsman. Girtin learnt drawing as a boy (attending classes with Thomas Malton), and was apprenticed to Edward Dayes (1763-1804), a topographical watercolourist. He is believed to have served out his seven year term, although there are unconfirmed reports of clashes between master and apprentice, and even that Dayes had Girtin imprisoned as a refractory apprentice. Certainly Dayes did not fully appreciate his pupil's talent, and he was to write dismissively of Girtin after his death. 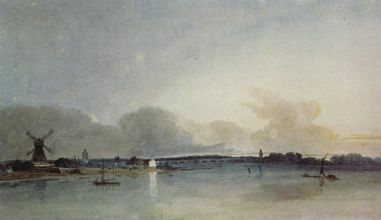 While still a youth Girtin became friends with J. M. W. Turner and the two teenagers were employed to colour prints with watercolour. 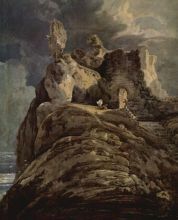 Girtin exhibited at the Royal Academy from 1794. 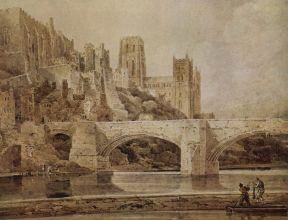 His architectural and topographical sketches and drawings soon established his reputation, his use of watercolour for landscapes being such as to give him the credit of having created Romantic watercolour painting. He went on several sketching tours, visiting the north of England, North Wales and the West Country. By 1799 he had acquired influential patrons such as Lady Sutherland, and the art collector Sir George Beaumont. He was the dominant member of the Brothers, a sketching society of professional artists and talented amateurs. In 1800 Girtin married Mary Ann Borrett, the sixteen year old daughter of a well-to-do City goldsmith, and set up home in St George's Row, Hyde Park, next door to the painter Paul Sandby. By 1801 he was a welcome houseguest at his patrons' country houses such as Harewood House and Mulgrave Castle, and was able to charge 20 guineas for a painting, but his health was deteriorating. 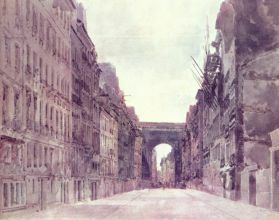 In late 1801 to early 1802 he spent five and a half months in Paris, where he painted watercolours and made a series the pencil sketches which he engraved on his return to London. They were published as Twenty Views in Paris and its Environs after his death. In the spring and summer of 1802, Girtin produced a panorama of London, the "Eidometropolis", 18 feet high and 108 feet in circumference which was exhibited with success that year. It was notable for its naturalistic treatment of urban light and atmosphere. That November Girtin died in his painting room; the cause was variously reported as asthma or "ossification of the heart." 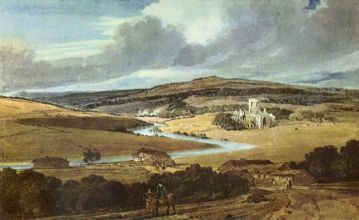 Girtin's early landscapes are akin to 18th-century topographical sketches, but in later years he developed a bolder, more spacious, Romantic style, which had a lasting influence on English painting. The scenery of the North encouraged him to create a new watercolour palette of warm browns, slate greys, indigo and purple. He abandoned the practice of undershadowing in grey wash and then adding pastel patches of colour, in favour of broad washes of strong colour, and experimented with the use of pen, brown ink and varnish to add richer tones. Girtin's early death from consumption led indeed to Turner saying, "had Tom Girtin lived I should have starved." The British Museum, Tate Britain, and the Victoria and Albert Museum have collections of his work.